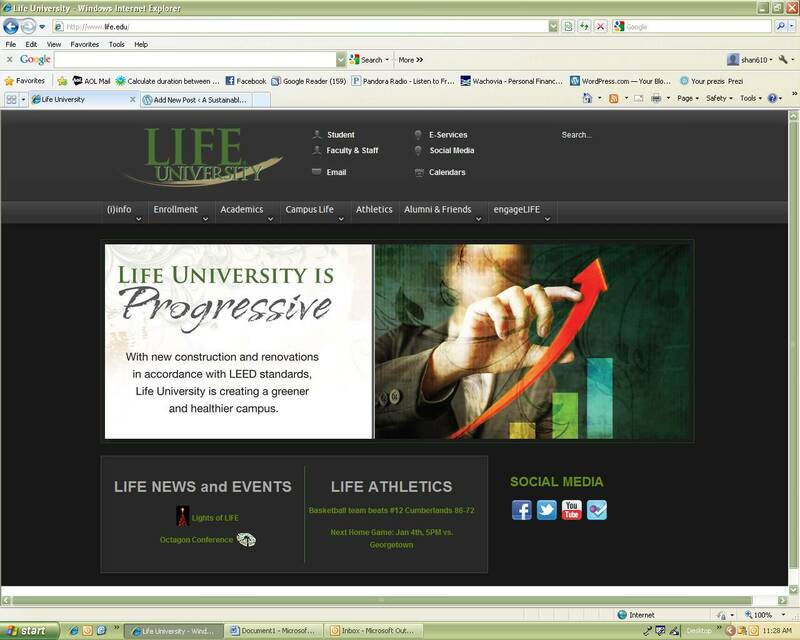 Life University is excited to announce the launch of our new website, which went live today, Monday, December 19, 2011. The new navigation and structure is much more user-friendly, making it easier find what you are looking for more quickly and easily. The new website has also made it easier to find campus blogs, including A Sustainable LIFE. To find A Sustainable LIFE go to the homepage www.LIFE.edu and click on the engageLIFE tab. Here you will find a link to A Sustainable LIFE as well as other campus blogs, social media, and other interactive services (Bb, Webadvisor, iPhoneApp). We are confident you will like the new website much more than the old one, so please enjoy surfing your way through and getting to know LIFE a little better. We hope you enjoy the new http://www.LIFE.edu!